A CYT Chicago production, onstage at the Prairie Lakes Theater, Feb 15–24. Be careful what you wish for, as Stephen Sondheim’s and James Lapine’s cockeyed fairy tale comes to life in this adaptation of their groundbreaking, Tony Award-winning musical (suitable for all ages). 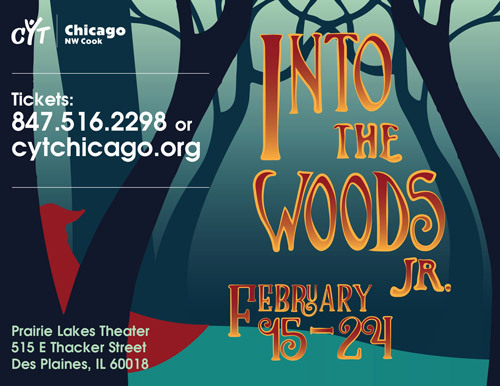 Into the Woods Jr. features all of your favorite characters – Cinderella, Little Red Riding Hood, Jack and his beanstalk, and the Witch, in this lyrically rich retelling of classic Brothers Grimm fables. •Child, and senior prices available. •Please call for handicap seating. CYT (Christian Youth Theater) is a non-profit, educational theater arts program for students 5-18 in the Aurora, Cook, DuPage, Kane, Kenosha (WI), Lake, McHenry, Milwaukee (WI), Oak Park, Orland Park, Rockford Metro, and Shorewood areas and has approximately 6,000 students per year. Each area offers summer camps and after-school classes in dance, voice, drama and theatrical specialties, and performs three fully staged musical productions per year. 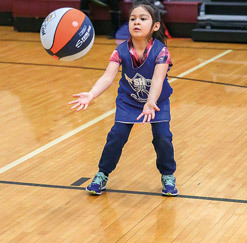 CYT is non-discriminatory and welcomes all children.